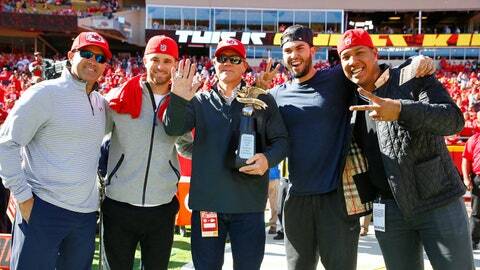 Kansas City's championship-chasing baseball team showed up to support the Chiefs. The Kansas City Royals are American League champions — and awesome neighbors. They’re about to mount a World Series chase, but manager Ned Yost and Co. still managed to support their football-playing friends at Arrowhead Stadium on Sunday. Chiefs fans hope some of the Royals’ mojo rubs off. They were in desperate need of a win against the Steelers on Sunday after five straight losses. The fact that they brought the American League Championship Trophy can’t hurt, right? Maybe some Chiefs stars will return the favor. The Royals and Mets play right across the parking lot at Kauffman Stadium for Game 1 of the World Series on Tuesday.